Myron Ebell A Telling Choice To Lead Trump's EPA Transition Team : The Two-Way Myron Ebell has been chosen to lead the president-elect's transition team for the Environmental Protection Agency. Ebell is a well known climate change skeptic. 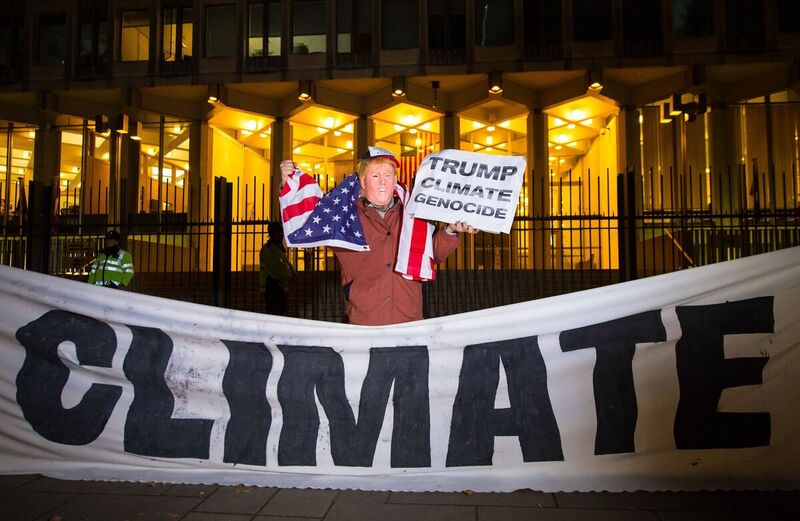 A protester dressed as Donald Trump demonstrates outside the U.S. Embassy in London. The good news for those worried that the U.S. will lose its leadership role in confronting climate change: President-elect Donald Trump said Tuesday, "I have an open mind to it. ... I do have an open mind." At a meeting Tuesday with New York Times journalists and executives, Trump said he thinks "there is some connectivity" in terms of human activity causing climate change. However, he went on to say that "it depends on how much" connectivity. "It also depends on how much it's going to cost our companies. You have to understand, our companies are noncompetitive right now." Then he noted that he also finds the climate issue interesting because "there are few things where there's more division than climate change." Climate researchers would not agree, at least when it comes to the science. Despite what contrarians maintain, the overwhelming scientific consensus is that human activity is warming the planet, with potentially devastating effects to the environment. And the United Nations did just manage to hammer out the landmark Paris climate change agreement, which went into force earlier this month. Now the future of that accord is in doubt. During the campaign, Trump promised to dismantle the Paris Agreement; he told the Times on Tuesday that "I'm going to take a look at it." On climate change, Trump says he is also thinking about "how much it will cost our companies” & the effect on American competitiveness. It seems unlikely that Trump — who has called global warming a hoax perpetrated by China — has dramatically changed his views on climate change. Consider that on the same day he was informing the Times that he's open-minded, Trump formally announced that Myron Ebell would lead his transition team for the Environmental Protection Agency. That's a telling pick for those who've been watching debates over climate and energy. Ebell was one of seven people whose faces were recently featured in an activist campaign labeling them "Climate Criminals." He directs the Center for Energy and Environment at the Competitive Enterprise Institute. It's one of the few conservative, free-market groups that's been an accredited non-governmental organization at the United Nations' climate meetings. Ebell has long questioned mainstream climate science and has argued against any need to rein in greenhouse gas emissions that are warming the planet. "There is serious scientific debate about the magnitude, rate, and potential impacts of global warming, and the policies appropriate to address it. And, I believe that we should pursue energy policies based on the scientifically-supported view that abundant energy makes the world safer and the environment more livable, as well as the humanitarian view that affordable energy should be accessible to those who need it most, particularly the most vulnerable among us." Ebell said he and his colleagues at the Competitive Enterprise Institute agree that carbon dioxide is a greenhouse gas and that concentrations are increasing as a result of burning coal, oil and natural gas, and that this means the global temperature is likely to rise. "Where we disagree with global warming alarmists is whether this amounts to a crisis that requires drastic action," he wrote. "There is much evidence that the mild global warming that has occurred since the end of the Little Ice Age in the mid-nineteenth century has been largely beneficial for humanity and the biosphere. Earth is greening, food production has soared, and human longevity has increased dramatically." NPR reached out to the EPA to see what, if anything, Ebell has started to do at the agency. A spokesperson replied that "EPA is now in contact with the president-elect's transition representatives and will begin to brief those individuals." In a fact-sheet released by the Obama administration earlier this month, the White House said the briefings would include "organizational charts, budget materials, briefings on key agency priorities and areas of responsibility, and other materials describing the essential functions of that agency."